History: Decommissioned to reserve on 26 April 1963. The Italian blockade breaker Cortellazzo had departed Bordeaux bound for Japan on 29 November 1942. The next day the ship was spotted by a Sunderland flying boat. The British destroyer HMS Redoubt (Lt.Cdr. N.E.G. Ropner, DSO, RN) and the Australian destroyer HMAS Quickmatch (Lt.Cdr. R. Rhoades, DSC, RAN) were detached from convoy KMF-4 to intercept the Italian ship. They did so on 1 December and after the Italians had abandoned ship she was sunk by torpedo by HMS Redoubt about 470 nautical miles west of Cape Finisterre, Spain in position 44º00'N, 20º00'W. The Canadian merchant Jasper Park is torpedoed and sunk south-southwest of Cap Sainte Marie, Madagascar in position 32.52S, 42.15E by the German submarine U-177. 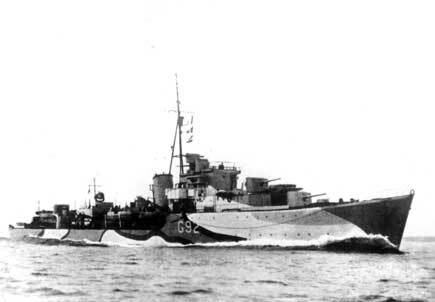 Later the Australian destroyers HMAS Quiberon (Cdr. W.H. Hartington, DSO, RAN) and HMAS Quickmatch (Lt.Cdr. O.H. Becher, DSC, RAN) together pick up 51 survivors. At 0500 on 25 December 1944, HMAS Quickmatch (Lt.Cdr. O.H. Becher, DSC, RAN) was ordered from port during what became known as the "Christmas Scare" off Sydney, Australia. The German submarine U-862 had torpedoed the merchant Robin J. Walker. At 2300, the destroyer found the still sinking liberty ship. It left to search for survivors. It lost radar contact with merchant ship at 0300 on the 26th and assumed it sank. Two hours later, it was guided to lifeboats by Catalina aircraft and rescued Captain MacRae and the 66 surviving members of his crew.